And welcome to my newsletter for September, 2014! Please feel free to forward this to anyone whom you believe might be interested in keeping up with me! To receive these newsletters regularly, drop me an email or subscribe online from my website ( http://www.JefMurray.com ) or at: http://groups.google.com/group/Mystical_Realms . After a bit of reorganizing and re-envisioning, Oloris Publishing is on the cusp of announcing a new website with a new store, new initiatives, and much many intriguing new books, prints, and other items that will be becoming available in the next few weeks. Look for their new site at www.OlorisPublishing.com . “It is true that the Hobbits were the first to put pipeweed into a pipe and set fire to it,” said the old man. 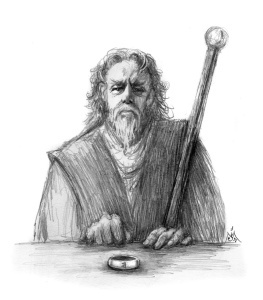 “But, it is also true that I was the first to make the latter step unnecessary.” Alatar drew gently on the odd device in his hand and blew several smoke rings, each of which neatly threaded its way through the ever-widening circle of its predecessor. The smoke curled and wreathed the kerosene lamp overhead, and from the thicket beyond the edge of the porch, the evening din of frogs and cicadas was deafening. He held up what appeared to be a typical tobacco pipe, but embedded in its stem was a glass cylinder. Within that cylinder, a transparent liquid glowed blue in the dim light. “What was it you called it?” Charles asked. Alatar drew deeply at the mouthpiece, and then breathed out the smoke in a large plume. Beyond the light of the porch, the two men could hear laughter, and a dim knot of figures could be seen approaching the front gate. “Good evening, gentlemen!” A tall cloaked man waved his hand as the group passed by. The man nodded, and then rejoined his group. They faded off into the darkness that swaddled the village road. “What do I think? About the meaning of life? It seems that would be a better question for you to answer. You’re the one who’s had so many more years to ponder the issue, after all. And aren’t you the wiser of the two of us?” Charles smiled innocently. “You’re kidding, right?” Charles asked, returning the Qalyan. Alatar leaned forward in his chair, propping his chin atop his fingertips. He lifted his gaze toward the darkened front yard and stroked his short-cropped beard. The lightning bugs were just starting to twinkle in the bushes at the road’s edge. “Yes, for all people. That does not mean that He approves of our conduct along the way, by any means, or that all paths lead equally to Him, or even that all paths lead to him at all. But the desire that we all find joy, friendship, love, and hope; that we learn to want only the best for others; that we come to know that there is purpose to all we do; that there is meaning in honour, loyalty, self-sacrifice, and even suffering; I know that these are all true, and all part of the bigger plan…. “…but right now, part of that bigger plan is also awaiting us…at the Pony.” Alatar winked. “Are you so sure about that?” Alatar winked again. “Well, alright. But, speaking of mysteries, what about these mosquitoes?” Charles asked. “Are they part of that bigger purpose as well?” He slapped at another of the annoying creatures.